Cerber Security is capable to protect all contact forms on a website. The anti-spam engine is compatible with virtually any form. Tested with Caldera Forms, Gravity Forms, Contact Form 7, Ninja Forms, Formidable Forms, Fast Secure Contact Form, Contact Form by WPForms and WooCommerce forms. It’s a great alternative to reCAPTCHA. To enable protection go to the Antispam plugin admin page and check Protect all forms on the website with bot detection engine. In most cases, the antispam protection works fine with the default settings. But as a professional solution, Cerber offers several options to fine tune its anti-spam algorithm. Go to the Security Rules admin page and click the Countries tab. Create a list of countries by clicking on the country name in the left window. Selected countries are listed in the right window. To remove a country from the list, click on the country name in the right window. Once you’ve created the list, set its type. 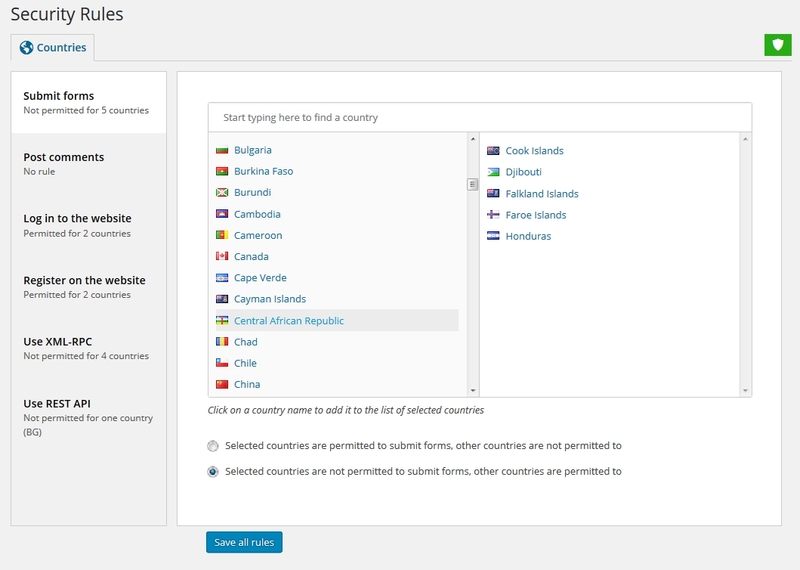 If you want to block form submissions from the selected list of countries, click Selected countries are not permitted to Submit forms, other countries are permitted to. If you want to allow form submissions, click the second option Selected countries are permitted to Submit forms, other countries are not permitted to. Click the Save all rules button. To completely block form submissions from a given IP address or an IP network or any combination of them add them to the Black IP Access List. Keep in mind that entries in both IP access lists have the highest priority which means they are processed first before any other rules and settings. Know more: Using IP Access Lists for protecting WordPress. You can set up exceptions for a given IP address or an IP network or any combination of them by adding all of them to the White IP Access List. Know more: Using IP Access Lists for protecting WordPress. Usually, you need to specify such an exception if you use a plugin or some technology that communicates with your website by submitting forms or sending POST requests programmatically. In this case, Cerber can block these legitimate HTTP requests because it recognizes them as generated by bots. That may lead to multiple false positives which you can see on the Activity tab. These entries are marked as Spam form submission denied. To exclude specific requests from inspection by Cerber, you need to specify a query string (a request URI) that is used for sending POST requests to your website. This string must not include the hostname or the site domain. 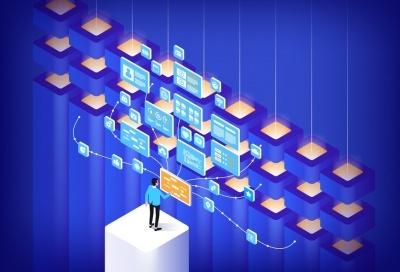 Cerber antispam engine looks for the specified string in an HTTP request URI and if a request URI contains specified string, the antispam engine doesn’t inspect the request. To exclude specific requests from inspection go to the Antispam admin page and enter some unique part of requests string (query path) into the Query whitelist setting. You need to use some part that uniquely identifies all requests you want to exclude. If you trust logged-in users, you can disable antispam inspection for all of them. The users will be able to use any form including comments without antispam check. If you come across some incompatibility with another plugin or theme, you can enable a special mode that tells the plugin to use less restrictive policies when it detects spam. Safe mode makes it compatible with the rest of the plugins and themes. Use it with caution. Is Cerber antispam engine compatible with reCAPTCHA? Absolutely. The spam detection engine is compatible with any captchas including reCAPTCHA that you can activate in the plugin settings. Please note: activating reCAPTCHA for the login form doesn’t protect a website from hackers. How does the antispam engine work? How to stop spam user registrations on your WordPress? Cerber Security has five antispam and antibot options which can be enabled simultaneously to stop the registration spam nightmare. Follow this guide: How to stop spam user registrations on your WordPress. I wish to allow only the US to submit and block all other countries. Which option is the correct selection?